The Thimphu-Paro expressway is a smooth section of tarmac which reduces travel time to just four hours so we had a lot of time on our hands. We enjoyed a grand breakfast at Hotel Silverpine where we had stayed the previous day after a strenuous trek to Tiger’s Nest. 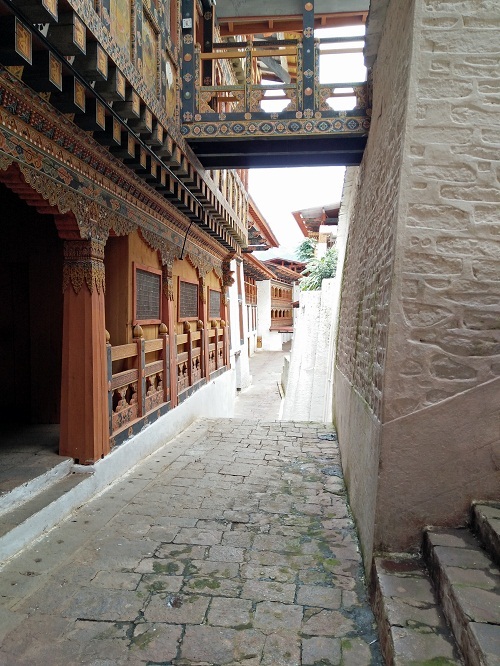 On the to-do list was a leisurely ride to Thimphu followed by a little meandering on the streets of the country’s capital. But Bhutan being the beautiful country that it is ensured that our four hour ride took significantly longer. While descending from Tiger’s Nest we made a few friends in the most curious circumstances. A few of us travelled together for the next few days. 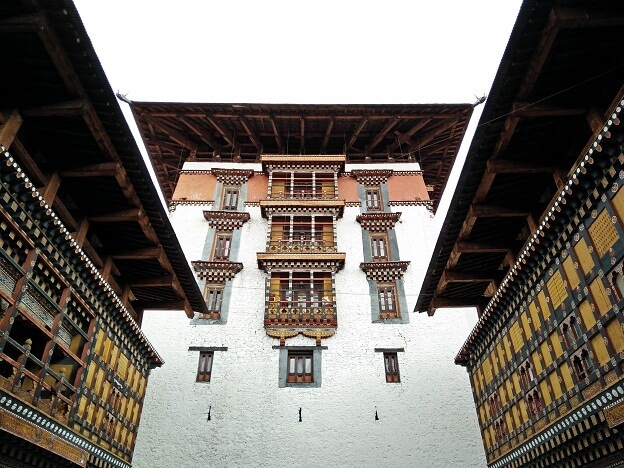 The first pit stop was Rinpung Dzong on the outskirts of Paro. 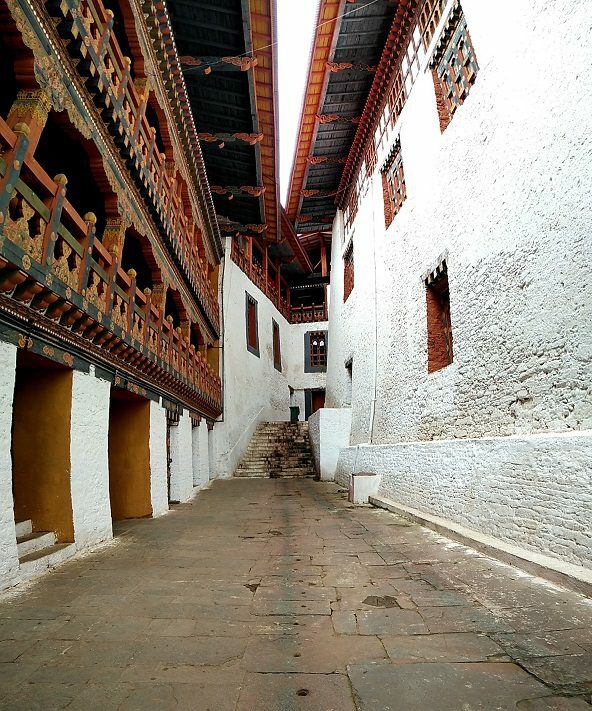 We strolled inside the dzong before riding to Thimphu. 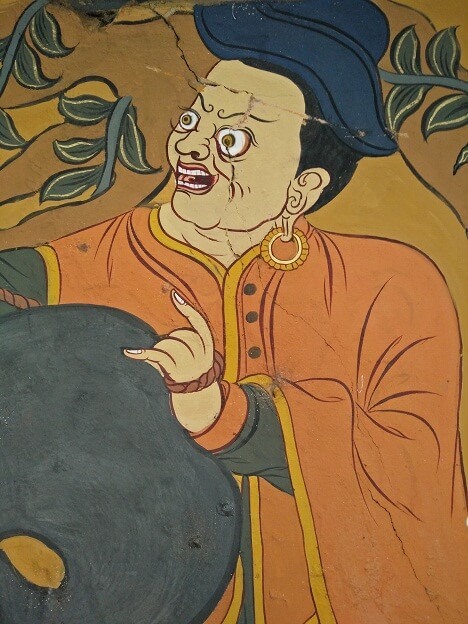 There were some very well illustrated and detailed murals inside the monastery. 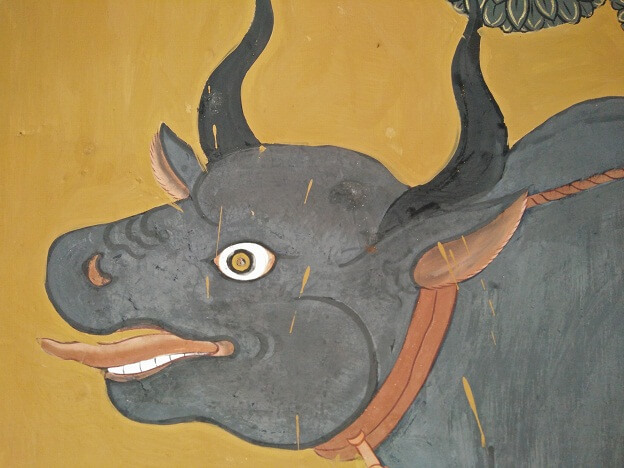 Enamoured by the murals, we hit the highway and rode at a calm pace, soaking in the morning beauty of the Bhutanese terrain. The ride was short and we were inside Thimphu in no time. The first stop was the immigration office where our permits were extended and next the Road Safety and Transport Authority (RSTA) to extend permits for our vehicles. 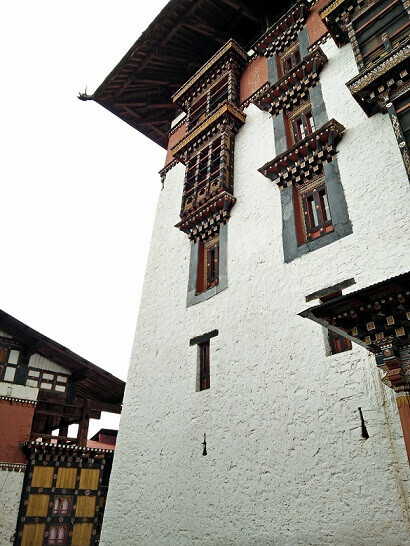 This was where we stated our proposed plan of travel in Bhutan. 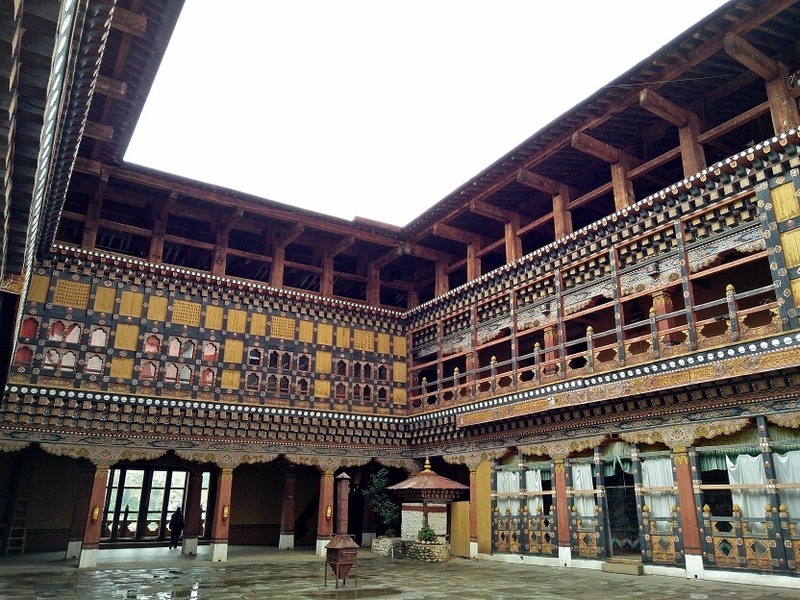 Paperwork was processed quickly and we experienced the first drops of rainfall after stepping inside Bhutan. Lunch consisted of dishes whose names we couldn’t quite pronounce but they tasted delicious nevertheless. 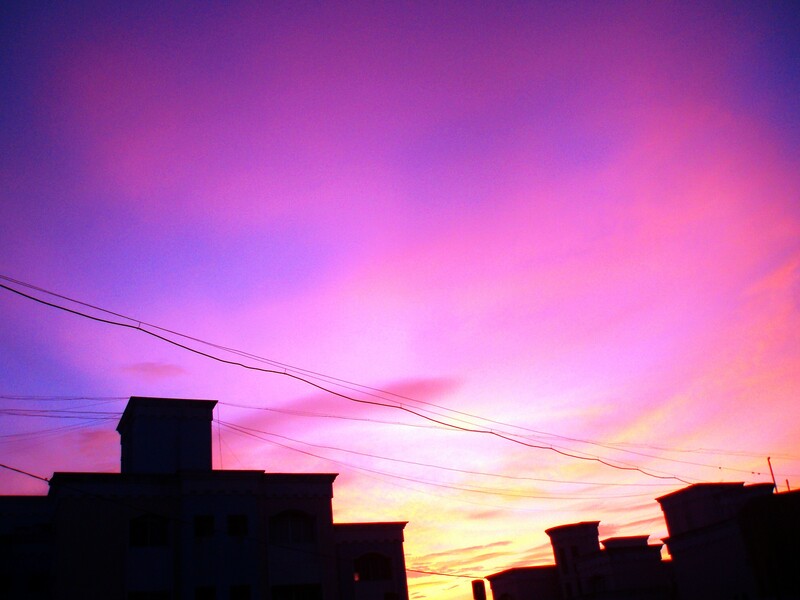 It was evening by the time we found a place to stay the night. 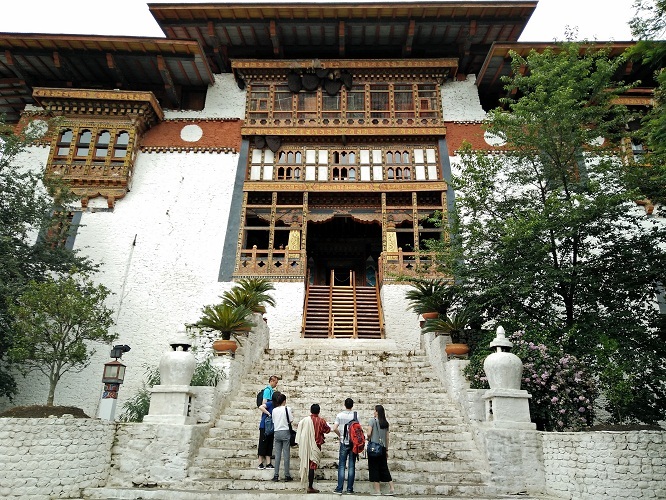 We rode up to Buddha Dordenma or Buddha Point and witnessed first-hand the scale of this monumental structure. At a height of more than 50 metres (almost 170 feet) it is one of the biggest statues of Buddha I have ever seen. The weather got chilly as dusk approached and we rode back to our hotels to freshen up. Thimphu by night was a lively affair . We visited Ambient Cafe which serves the best coffee in town. Do check them out if you visit Thimphu. Beautiful lighting and photographs adorn the walls and they even sell apparel. For dinner we headed over to Cloud 9. Now Cloud 9 is one of those restaurants which you don’t find easily but the food they serve blows away your senses. Burgers are their speciality and the moment they were placed on our table, we knew we were in for a treat. The smell, sight and ultimately the taste took us to heaven and back. I wish this were a paid article because I would write them 2,000 words worth of praises. We walked home languorously, tummies full and appetites satisfied. Cloud 9 stayed in our thoughts for many days to come. 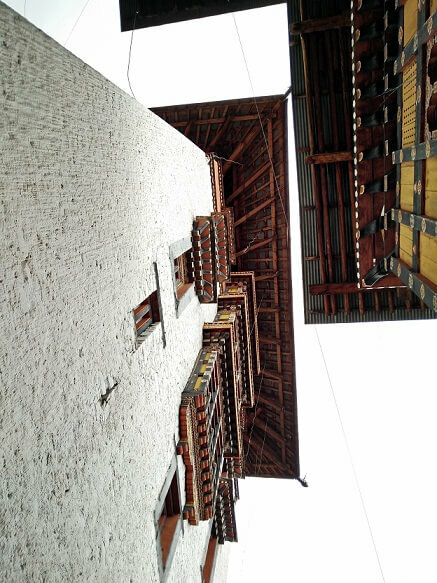 The next morning was supposed to be a visit to Gangtey monastery followed by a night-halt at Trongsa. The distances to be covered were not that great and, according to maps, realistic but we were oh-so-very-mistaken. What follows is an account of the harrowing but rewarding ride from Thimphu to somewhere in the middle of nowhere. The roads leading out of Thimphu were very good but after about an hour of riding we hit a few dirt patches which thereafter turned into outright slush. We were restricted to second-gear-standing-on-footpegs riding and made slow progress. At times the slush was thick enough to even cause cars to go sideways at the slightest hint of acceleration. We on our bikes were scared shitless… well almost. One of the people we met at Tiger’s Nest was also riding through Bhutan on his motorbike and so we were a group of three, the best number for a group ride. We halted for some time at the top of a hill where the only restaurant was unbelievably expensive. One tea costed the equivalent of an entire breakfast in a reasonably priced restaurant (but then again – define reasonable). So we carried on and slowly progressed towards Punakha. The roads improved and soon we found ourselves looking at the monastery from across a river. 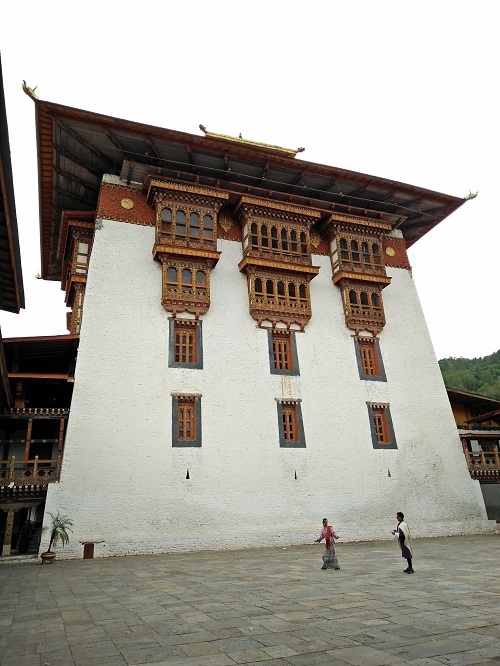 Punakha Dzong was built in the 17th century and is the second largest dzong in Bhutan. 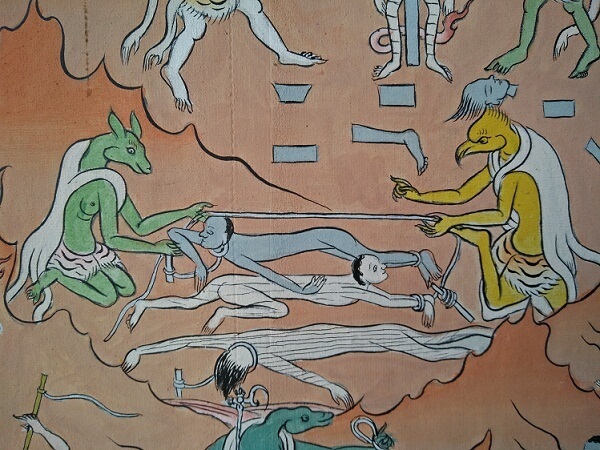 It houses a great number of relics and a number of sections of the monastery are not open to the general public. It consists of a number of structures all interlinked by corridors. 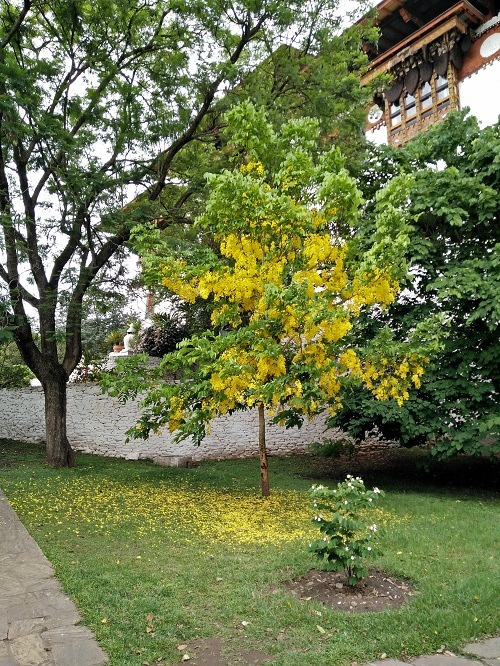 You need a good hour or two to walk through the entire compound and appreciate its beauty. A much needed lunch gave us the energy to proceed. Half an hour of riding later we ran into a landslide as it was being cleared by a JCB. The landslide seemed to be fairly recent judging by the number of vehicles waiting on each side. It took about 20 minutes of skilled earth-moving for the JCB operator to clear the road. We thanked the crew and rode on. The road did not get any better and we were completely in the thralls of tarmac covered by more than half a foot of slush. Going was slow. At one point we had to dismount and place rocks on the ‘road ‘ so that cars could drive through the slush. Often we found ourselves negotiating corners while watching the cliffs overhead looking out for falling rocks or worse. Traffic became very sparse towards the evening and we were still very far from our determined destination. After a lot of solitary riding we saw a group of monks getting out of their vehicle just as we were approaching. It had been a while since we had seen any people on the road so we halted and gratefully chatted with them. 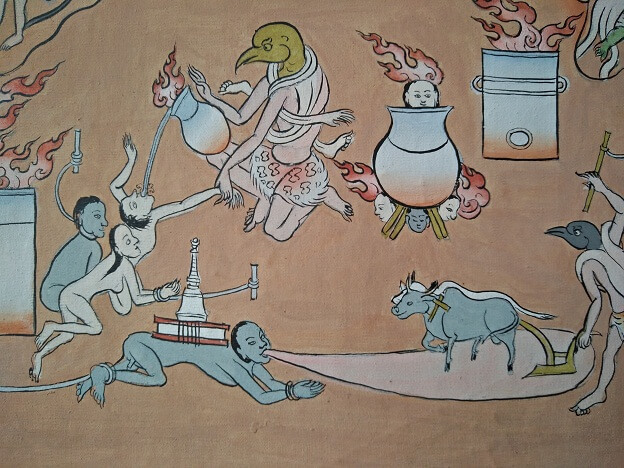 They completely ruled out reaching Trongsa as the roads were simply too dangerous to traverse at night. They suggested riding another 20 odd kms to the nearest hotel. Twilight approached and we rode through the slush and occasional stretches of road. Rain had also made its presence felt by this time. There were plenty of small to medium sized rocks on the road but thanks to the bright LED lights on the Bullet ridden by Abhishek we had a good view of the road ahead. Night settled on the mountains and we faced a heavy drizzle. The decision to continue riding was questionable but we could not have stopped in the middle of nowhere in landslide territory. We simply had to keep moving. Eventually we reached a small town and halted for a much needed break and some tea. Speaking with the locals we learned that another landslide had blocked the road up ahead. A JCB crew was working on clearing the road but they had no idea how soon the route would be cleared. The guy we spoke with happened to be a local police official and requested that we sleep at the police station that night if the route wasn’t cleared in time. We thanked him and readily agreed. 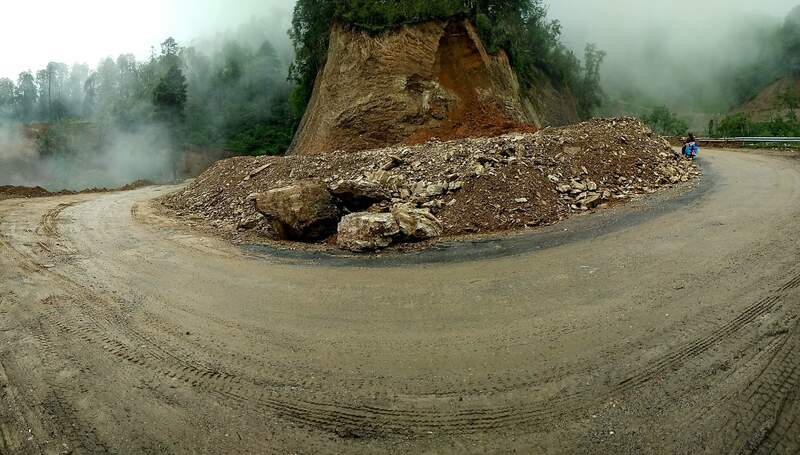 Not soon after traffic started appearing which meant that the landslide had been cleared. So we rode on. When we crossed the scene of the recently cleared landslide it was like passing a war zone of sorts. Huge logs were strewn on the road. A mini-stream was making its way down the slope and precariously placed rocks dotted the hill side. The road itself had been narrowed down to a slim belt due to the dirt on either side. I doubt that we appreciated the full extent of the damage at night but rest assured it was an eerie experience. Add to that the occasional glimpse of the deep, dark valley and the sound of gushing white water streams at the bottom. I dared a peek down the slope but a skipped heart beat told me that it was not the most advisable thing to do. We kept our concentration on the road ahead. Eventually, we saw lights in the distance and soon enough spotted buildings. The police official had advised us about hotels in the region . We enquired at two different buildings and both didn’t have any room left but assured us that a hotel further up the road would have empty rooms. Sure enough the next hotel we encountered had one last room up for grabs and we were the lucky ones who made it in time. In a rush of jubilation we asked for their best whiskey to celebrate the moment. Dinner was much needed and quick to arrive . We chatted with the hotel owner, Jigme Namgay, as we settled down to eat and he said that he had worked in India many years ago and was nicknamed ‘kabhi-kabhi’ for some reason (translates to ‘sometimes’). He was an accommodating host and we were very grateful to him. Though the air was quite nippy, we were able to savour the moment before sleep took hold of us. The next morning we learned that we had halted at Dungdungneysa. So Trongsa was just about 80 kms away. Shouldn’t take too long to cover that small a distance right…? Wrong. Those 80 kms took up the entire day from dawn to sunset. We did, however, have an eventful ride which involved riding through fog, under under precarious outcroppings, next to mesmerising valleys and witnessing the quaint little town which is at the heart of Bhutan. Thanks! 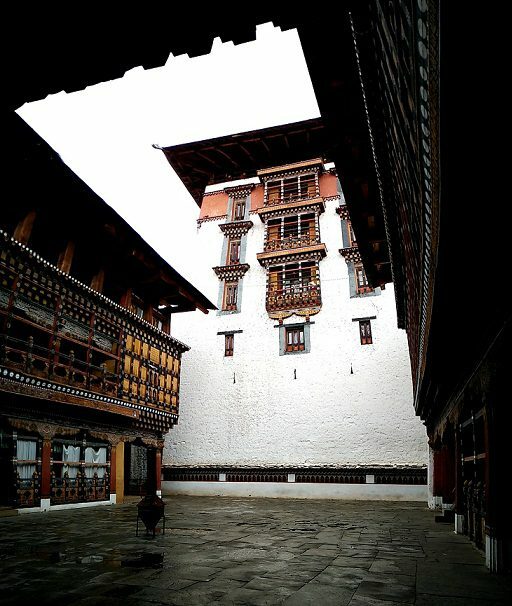 Bhutan is a really lovely place!